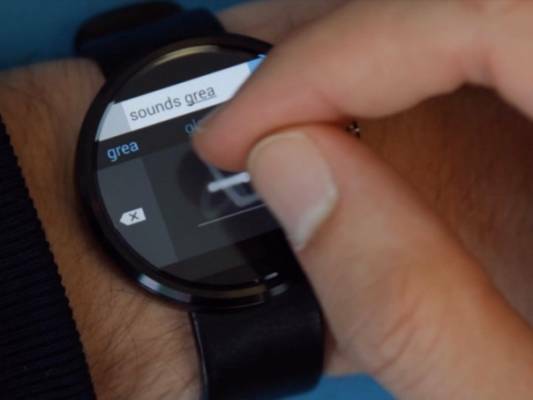 Due to their small screens, Android Wear smartwatches have made voice commands the primary way to input text as needed - and curiously, it’s Microsoft (not Google) paving the way for a tiny touch keyboard option on the devices. As seen in the above video, Microsoft’s keyboard lets you use your finger to draw each individual letter on the smartwatch screen to tap out a quick text message response or search query. It’s more time-intensive than simply speaking out your command, but if you’re in a quiet space and don’t want to pull out your phone, we could see it being a handy feature. The keyboard comes from Microsoft’s Research arm, which recently unveiled a transparent tablet cover that adds a physical layer for creative work, along with a room-transforming gaming concept. The app only works with devices with square 320x320 displays, along with the Moto 360, and it's available to download for free right now.